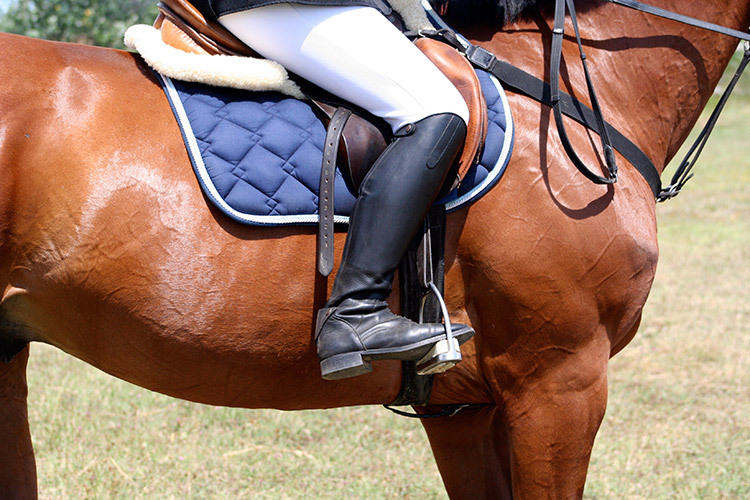 You need the right horse riding boots for when you are both mucking out, working around the stables or riding, so it’s important to choose the right ones for the job. There are several different styles to choose from – depending upon the type of work you will be doing and what the weather is like. Horse riding boots are primarily for safety around the horse and for the most appropriate boot to aid comfortable riding. Look out for something that has a little bit of grip, a small heel to prevent your boot slipping through the stirrup when you are riding. Try to avoid anything too chunky as you need to be able to fit your foot easily in the stirrup without it getting caught on the sides. Traditional boots are tall black riding boots that come up to just under the knee and are still widely used for most disciplines of riding. They are also used for competing including dressage and eventing. Jodhpur boots – sometimes known as paddock boots are ankle length boots that can be worn with half-chaps for everyday riding. They are usually pull on-style and can be worn for mucking out as well as riding. These aren’t usually permitted for competing but are perfect for schooling. If you prefer something more casual – you can go for something like trainers – they aren’t actually trainers – and are specially made for horse riding, but they are trainer style with a little extra support in the sole and ankle. If you are just beginning your riding experiences, you may not want to splash out just yet, until you know you are going to love this hobby. Have a look in your wardrobe as there may be something in there that you can use. Just make sure it is durable, you don’t mind it getting mucky and there is a small heel, a grip and it is slim enough without being flimsy, to fit into the stirrup.